Ahh, Florida winter. This weather reminds me why I do like it here, despite my beating heart that lives in the West Village. We’re having a run of low-70-degree days, and that means I can actually wear some tights. And open the windows! 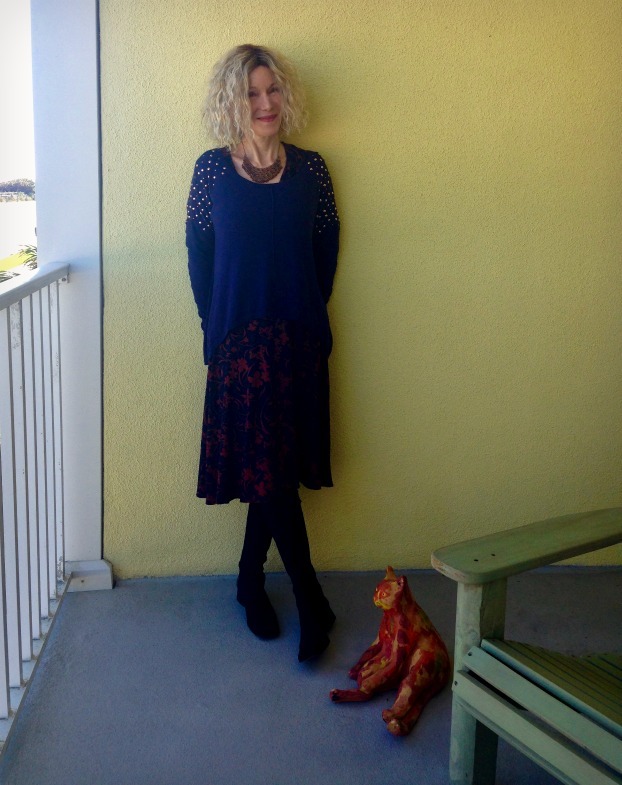 Today I decided to layer a favorite Karina dress – the Ruby – under an old faithful studded sweater (similar). The sweater is starting to look worn, and I will miss it when it goes. Just the right weight for Florida winter, and with personality. The bib necklace (sim) was found at a local consignment shop for about $10, and the tall fabric Donald J Pliner boots (sim) I bought in a NYC thrift. Love the studs on the shoulders, although I’m sure they’re off-trend now. We don’t care about that, do we? Wear what you love. Not the best exposure, eh? But I like the contrast with the ocean dunes. What a great color on you Patti, and I Love your hair. Wish mine had an inkling of curl! Fabulous sweater, and it looks great over the dress. That’s the beauty of Karina dresses – they are lightweight enough to layer over tights and under a jumper as well as being perfect for Summer. Wishing you a very happy 2017! So beautiful in blue, Patti! Love the studded sweater, so chic! Low 70s! geez. Today it was 6, again. But you look lovely. Showing off the fact that you don’t need a coat outside. yeah, bay-bee. You always look so relaxed and happy within your skin Patti. Radiant too in the last photo with that darling smile. You are a thing of joy. Studs are forever, and so what if they’re not – we can still wear them. Thanks for the link up party! Thanks for the link up, Patti…have a wonderful week! That truly is the ideal temperature. One of the reasons I liked living on Vancouver Island was because of their mild temperatures. It was never hot or cold, it was pretty much “just right” 80% of the time. I like the sweater and the studs. In fact I’ve been thinking about adding some studs to a leather skirt. I linked up a beautiful cat brooche that should appeal to you! You can send some of that Florida winter to me in Michigan, any day. Happy Monday Patti! My mom is in Florida now too and having cold evenings and nights. It is hard for us to sympathize with her while we’re here in Michigan. At least you get to open your windows! I can’t stand when we can’t do that and, for us, it’s the cold, not the heat, that stops us. Well at least it’s a good week for you to pull out all your cold weather gear! Love this combo. So many beautiful details in the way things hang, fit, and layer. Not to mention the studded shoulder! Love it. Pingback: Shiny Black Leather! - When the Girls Rule - A Fashion Blog for Women over 40 With Big-Busts, Apple-Shapes and Style! On a different note: studs never go out of style, and you rock! Ah yes, Karina dresses are wardrobe faithfuls aren’t they? I have no idea if studs are trendy or not, but they look great on your jumper! That sweater is pretty fabulous and perfect with the dress! So jealous that you can open the windows and get some fresh air…yesterday it was 8 degrees so that’s not really an option for me…lol! I love your hair so very much, dear patty. Thank you for this lovely party. 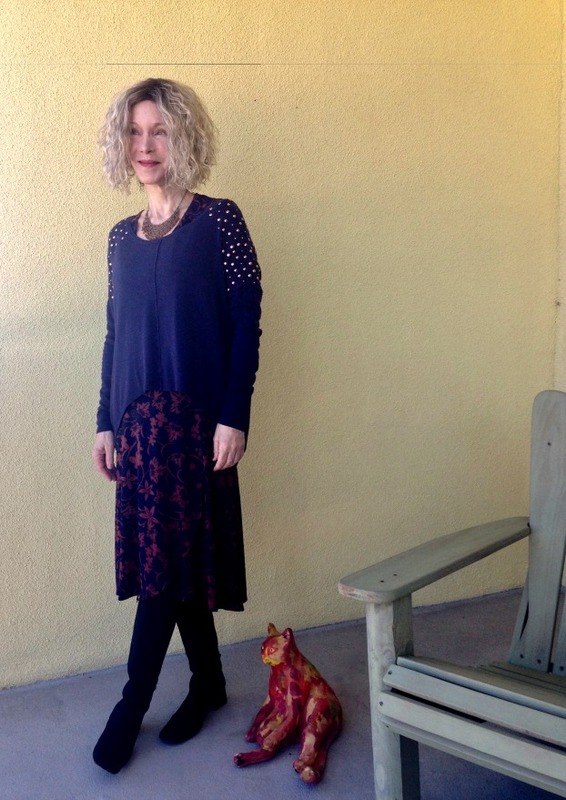 a dress, a cardi, and boots make for an easy formula for looking stylish and you’ve got it nailed. thank you for hosting. Beautiful! And I LOVE the studs!! Enjoy your weather! I’m looking forward to visiting my daughter (lives in South Beach) and then my sister (lives outside of Tampa) next month! It’s been 4 degrees last night, and 1 degree tonight! I’m jealous of your warm weather. But at 70 degrees, I’d be taking OFF the tights! You look fabulous as always! I still love studs on things Patti – who cares if they’re on trend or not, eh – yours are fab! Fabulous look! And love the studs on the shoulders too! Love how you layered this dress, and I’m laughing my head off that you put on tights when its low 70’s, that when I bring out my shorts. Looking fabulous as always. I really like the studded shoulders, Patti! I mean shoulders are having their day, right? So why not studded?? I’m all about cute details and the studs on the shoulders are adorable as you are in them!! Personally, I love the studded shoulder on your sweater… or on anything really! The more embellishment the better! Happy New Year, and thank you as always for hosting, Patti!